Next on the Thanhouser release schedule was a split-reel offering on February 7th. While Mrs. McFadden Looked Out featured Riley Chamberlin in the title role depicting a snoopy lady who was so busy watching neighborhood activities from her window that she was oblivious to what was going on in her own house, including the repossession of her unpaid-for furniture and the battling of a blaze by firemen. At the end of the reel was Los Angeles the Beautiful, a different filler than the similarly-named footage distributed earlier; this one included views of Westlake Park, the Angels' Flight railway, and the National Soldiers' Home at Sawtelle. Here is a beautifully pictured light comedy which gets over nicely. Flo LaBadie arrives at the big California hotel with her aunt, and three men immediately plan to strike up an acquaintance. All succeed, but the bird finally flits away, and they discover she is a great writer looking for material. The disconsolate poses at the last of the film are very effective. A good offering. Husband and wife quarrel over petty household matters, and the wife decides, through the advice of a friend, that divorce is her only solace. Husband leaves home on a business trip, and wife is enroute to Reno. On the train a strange woman places a baby in the husband's lap as wife enters. Husband's troubles are many, and then wife helps him to mind the infant. Its mother reappears, takes her charge and the couple are reunited. Such is the story, briefly told. It is most effectively done and is a laughable comedy from its start. The Pretty Girl in Lower Five, distributed on February 18th, saw Florence LaBadie in the title role and was photographed on board the train during the West Coast Company's trip to California in mid-December. Additional footage taken in California, primarily of Mt. Lowe, a tourist attraction with an inclined railway, completed the scenario. Then on February 21st came The Two Sisters, one of whom was Jean Darnell. The New Rochelle police parade - the one that Lloyd Lonergan caused to be delayed for 15 minutes while he arranged for a cameraman - was featured in The Ghost in Uniform, issued on February 23, 1913. The old police headquarters in New Rochelle is abandoned, and operations are shifted to the new. Marie Eline, as a little orphan newsboy, seeks shelter in the old headquarters. For warmth she dons a grossly oversize police uniform that she finds, and in this garb frightens two hoboes who also decide to seek shelter there. To one who has not read the famous detective story by A. Conan Doyle then this two-reel photo play by the Thanhouser company will appeal only weakly. The various incidents of the development of the tale are loosely hinged together, and deduction, which plays such an important part in the book, is crudely applied here. For one who has read the story, the picture will retain a passing interest in spite of the fact that the actor in the role of Holmes appears more like a college student than the character as depicted in the book and on the stage, and though some of the reasons the detective uses to fathom his mysteries seem childlike. The business with the dog taking the scent is travesty and could well be eliminated from the picture. Considerable care has been taken with the settings and the acting on the whole is well up to the Thanhouser standing - meaning that it is good. When Dreams Come True, first distributed on February 28th, was produced by the Fairview Place studio players. The scenario was a copycat version of Farm and Flat, the June 23, 1912 film which told of a city couple exchanging places with a farmer and his wife, after which each couple realizes their mistake. 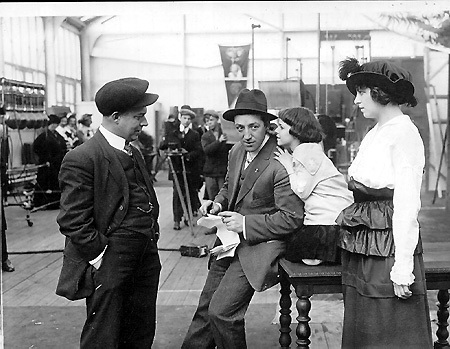 The February 1913 film depicted a New York City couple, portrayed by Peggy Reid and John Adolphi, who trade places with a California couple who own an orange grove. In due course, the transplanted city folks miss the lights of Broadway, while the former residents of the Golden State miss the orange trees. John Adolphi, who worked with Thanhouser only briefly, was later to achieve prominence as a director for Reliance, Universal, Fox, and Warner Bros. Photography is especially poor in the third scene, where the wife sits and dreams on the porch. Both the young man and his wife long for the comforts and ease of wealth. If we are to consider the orange grove which they own we would imagine that they possessed all the wealth that was good for the average soul. The young man's uncle leaves him a fortune of $500,000 and, after leasing the farm, the couple go to the city to live. After a time their life in society palls upon them, and they return to the farm. Longing for wealth with the possession of this vast farm - as it appears to be - makes the story inconsistent and false. It is only mildly entertaining. The Way to a Man's Heart, released on March 2, 1913, depicted William Russell as a Maine boy who travels west but longs for New England cooking. All ends well 15 years later when he spies a sign, "New England Boiled Dinner 25 Cents," stops his automobile quickly, rushes in, meets a waitress, and through a sequence of events finds that her mother, the cook of the establishment, is his old landlady from the East. He marries the waitress and for the rest of his life enjoys New England cooking. At least two reviewers pointed out that the cook hadn't aged a bit during the supposed 15-year time lapse in the film. Such critical reviews, a number of which appeared for various films released during this time, indicated that the Thanhouser Film Corporation was spreading itself too thin, with too many projects in too many places. The Fairview Place studio in Los Angeles, some 2,500 miles away from Charles J. Hite's personal supervision, was not adding to the company's reputation. Next on the Thanhouser schedule was His Heroine, released on March 4th. On that very day Charles J. Hite and a cameraman went to Washington, D.C. to witness the inauguration of Woodrow Wilson as president. The next morning Hite was back in New York with the negative, had it developed, and that afternoon screened the film at the Ideal Theatre, a Bronx movie house. The documentary was not released on the regular program but was saved as background for a forthcoming Thanhouser subject, The Patriot, which would see distribution a month later. Her Neighbor, released on March 7th, was set in California. A young girl (Marguerite Snow) inherits an orange grove and decides to move there with some of her girl friends, to set up an "Adamless Eden," a community with no men allowed. All works well for a short time, until her friends tire of the work. Around the same time, a neighbor (James Cruze) comes on the scene with an offer to help, after which a trip to the altar is but a short time away. An Honest Young Man, issued on March 9th, told of a father who is proud of his son and who wagers with a broker friend that his son's honesty cannot be compromised. The father disguises himself as a blind man and puts a $500 bill in his tin cup. The son comes along, and to his father's dismay and shame, takes the money. The father is certain that his son will repent of the action, and tells the broker to wait for a while before he considers the bet won. Sure enough, the errant son returns and puts not only the $500 back in the cup, but adds extra money and jewels from his own holdings. "A well-pictured, enjoyable absurdity," commented The Moving Picture World. On the tail-end of the reel was appended a filler, Pasadena Chariot Races, a documentary photographed early in January. Just a Shabby Doll, released on March 11, 1913, included scenes of Washington Square in Manhattan, while The Idol of the Hour, issued on March 14th, was set in California. Babies Prohibited, first screened on March 16th, is notable as the first of a new series of Thanhouser pictures to carry cast member listings in related advertising. Notices stated that the film featured Lila Chester, Harry Benham, and Mignon Anderson. Moreover, a peek at the future was given: "Next week: Features with James Cruze and Marguerite Snow, Jean Darnell and William Garwood, Victory Bateman and Riley Chamberlin, Mignon Anderson and Dave Thompson...." Unfortunately for movie fans, this policy was to last for only a month, after which time anonymity, or the occasional mention of one or two players, became the rule in advertising once again. The Moving Picture World, March 15, 1913, carried this comment: "The Kraus Manufacturing Company, largely influenced by our agitation last fall, has arranged with the Kay-Bee, Broncho, Reliance, American, Thanhouser, Kalem, Majestic and Universal companies to manufacture sets of reproductions of scenes from all big releases on 8x10 cards. These are actual photographs and are being handled by the specialists in photoplay advertising. You can buy them direct and resell, or rent from the exchanges if you do not mind second-hand stuff. It will be a useful addition." Kraus was a leading manufacturer of movie star postcards and lobby portrait posters, and the above notice represents its first venture into lobby cards depicting actual scenes from films. The Kraus Company has just published additional [11x14 inch posters of Mutual players]. The new list includes Irving Cummings, Harry Benham, Warren Kerrigan, Fred Mace, Jack Richardson, J.B. Sherry, Edgena de Lespine, Marguerite Snow, Pauline Bush, Mabel Normand, the Thanhouser Kid, and Anna Little. The price is two dollars for the set of 12. They work out excellently well for lobby display. In early March, Dr. and Mrs. Wilbert E. Shallenberger, who maintained homes and business connections in Waterloo, Iowa and Chicago, visited New Rochelle and spent a week as the guests of Mr. and Mrs. Charles J. Hite. Shallenberger, a major investor in the Thanhouser Film Corporation, was becoming increasingly interested in the process of film manufacturing, and this was at least his third visit to the Thanhouser studio. "I am in charge of the inspection department of motion picture theatres in South Australia, and your advance notes on films will be of service to me. I might inform you that your films appear to be great favorites of the public attending our picture theatres nightly. There is a great public demand for motion picture entertainments, and I am of the opinion that it is the right kind of entertainment for the people. "I must take the opportunity of complimenting you on the excellent films that you produce weekly. They are splendid. Your films are clean and free from objectionable matter, and I might say uplifting for the people. A censor of films would not be needed if all producers turned out the same class of film matter that your good firm does." Excepting the photography, which is rather bleached out and indistinct, Won at the Rodeo is one of the best Western films we have witnessed on the screen, but the effort of the Thanhouser company to weave a photoplay or story into the affair proves rather unsatisfactory. We are shown some exciting scenes of horsemanship, bucking broncos, riding steers, bulls and mules, and pony racing. The girl's sweetheart is to ride at this meet. His rivals, fearing his success, determine to defeat him by injuring his horse. The girl overhears the plot and rushes into the arena in time to prevent the disaster. Flo LaBadie gives a capital performance as the cowgirl, and William Russell is excellent in the leading male role. Her Gallant Knights, issued on March 23, 1913, saw Florence LaBadie as the object of several suitors' affections. Once again, the setting was in a California orange grove. The Moving Picture World offered a somewhat contradictory comment, "Not strong, but rather pleasing," while The New York Dramatic Mirror found the story "ordinary" and the photography "poor - especially is the photography obscure and dark in the scenes depicting the orange exposition, and it is to be wondered at, for poor photography is not common to the Thanhouser company." Next on the Thanhouser list was For Her Boy's Sake, released on March 25th, which earned mixed reviews, mostly favorable. Cymbeline, a two-reel dramatization of one of William Shakespeare's less popular plays, directed by Lucius J. Henderson and produced in California, was issued on March 28th. The production, which featured William Russell as King Cymbeline and Florence LaBadie as Imogen, opened to favorable, but not enthusiastic, reviews. The Wax Lady, released on March 30, told of a grumpy man, ethnic background and nationality not specified in Thanhouser's printed synopsis, who owned a clothing store. After overcharging and mistreating his customers, he sees the light when a wax manikin comes to life and tells him the error of his ways. From that moment he is a changed man and becomes, in the words of the synopsis, "a benefactor to all mankind." The Moving Picture World commented: "A whimsical conception, in which a fairy brings to life the dummies in the old Jew's window. Numerous amusing situations develop and the Jew is punished for his general avarice and dishonesty. The film makes a good novelty with which to vary a program." This ethnic slur by a reviewer undoubtedly missed the original intention of the film, for the Thanhouser studio, under the direction of Edwin Thanhouser, as well as under the later supervision of Charles J. Hite, avoided critical characterizations of racial, religious, or ethnic types. On the contrary, the Thanhouser firm was ahead of its time in its presentation of minorities in a favorable light in an era in which Jews, Chinese, blacks and others were often disparaged in film scenarios. However, quality was faltering at the Thanhouser studio, and it could have been that this film simply slipped through the cracks, as did various instances of poor photography during the same period. Of course, the reviewer for The Moving Picture World was responsible for his uncalled-for comments, irrespective of the film's content. The Woman Who Did Not Care, the title of which was probably a take-off on vaudeville star Eva Tanguay, known as "The I Don't Care Girl," was released on April 1st and was a modern fairy tale involving a love affair, a witch, and a scarecrow. The Morning Telegraph found it to be "very well put on" and "a striking subject," and The Moving Picture World considered it to be "a successful offering of its type," but The New York Dramatic Mirror considered it "all so senseless and indifferent that one is more bored than interested." It was a time of social events in the motion picture industry. On Monday evening, March 31st, the Thanhouser employees staged their annual ball at Germania Hall in New Rochelle, where a good time was had by all participants. In early April, the Motion Picture Exhibitors' League of Greater New York staged a benefit at the 69th Street Regiment Armory, with approximately 5,000 people attending. The program included previews of various films, including Thanhouser's A Proposal by Proxy. From the studio, Demetrio Mitzoras, described as a Greek baritone, and David H. Thompson sang songs to Mignon Anderson's piano accompaniment. Harry Benham also sang, and Helen Badgley gave a recitation. Approximately $2,500 was raised for Indiana and Ohio flood relief. On Saturday evening, April 19th, the Screen Club held a ball at the Terrace Garden in New York City. The Thanhouser Film Corporation was a boxholder. The Spoiled Darling's Doll, released on April 4th, featured Marie Eline as the spoiled darling and Helen Badgley as her doll. Marie, a spoiled brat, reforms after her doll comes to life and points out how she has caused others to suffer. Reviewers liked it. When Ghost Meets Ghost, with Marguerite Snow as the lady ghost and James Cruze as the ghost in armor, was a fairy tale generally ignored by reviewers, although The Moving Picture World stated that "it is little more than an interesting novelty and not to be depended upon as a feature." The Patriot, issued on April 8th, featured footage taken at Woodrow Wilson's inaugural ceremony in Washington on March 4th. Eugene Moore played the patriot storekeeper, Carey L. Hastings was his wife, Mignon Anderson his daughter, and Harry Benham the suitor. The scenario was built around the same general theme as The Baseball Bug, the 1911 film in which a clerk thinks that the baseball world can't live without him. In the present film, a storekeeper from Cranberry Center is convinced that President Woodrow Wilson wants him in his new cabinet, and travels to Washington, where he is completely ignored, after which he limps home and resolves to attend to his storekeeping. The Changeling, issued on April 11, 1913, featured Marie Eline in two roles, as a millionaire's real son and as an impostor, in an unlikely scenario in which a boy who runs away from his wealthy home is secretly replaced by the look-alike son of an unscrupulous woman. The Morning Telegraph raved about the film, calling it "delightfully interesting" and suggesting that "the whole deserves featuring and might have been developed into a two-reel play." The Moving Picture World found it to be interesting and well-acted. However, The New York Dramatic Mirror found it to be "unconvincing" and said that "the picture gives the impression of being hastily produced and written." The Dog in the Baggage Car, released on April 13th, received mixed reviews, as did The Girl and the Grafter, issued on April 15th, while Retribution, released on April 18th, garnered mostly favorable comments. An article in The New Rochelle Pioneer, April 19, 1913, told of the exhibition of Thanhouser films in its home town: "It is reported that when the new picture house being erected by Mrs. Brunel on Horton Avenue is completed, which it is expected will be about May 1st, the Thanhouser Film Co., will exhibit their pictures there. This will be the only theatre in this city which will show these films." From time to time over a period of years various New Rochelle theatres featured Thanhouser films, then dropped them. During summer months, Thanhouser releases were often shown at the theatre in the amusement complex on Glen Island.